Baldwin Park Truck Accident Injury Attorney - Over 40 Years of Experience You Can Trust! Were You or a Loved One Injured in a Truck Accident or Car Accident in Baldwin Park? Passenger Cars and Light Trucks combined make up 78.8% of vehicles involved in fatal crashes in the U.S.
Our Baldwin Park truck collision injury lawyers and law firm provide vigorous and compassionate legal services for those injured in truck accidents, even crashes that involve recreational vehicles or motor homes, and for the families of the victims killed in truck and other deadly accidents or for wrongful death claims in Baldwin Park, a city with 75,390 people in Los Angeles County, California. Baldwin Park is a historical site in California by initially being used for cattle grazing. 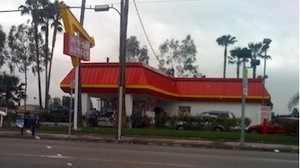 Baldwin Park is proud to have had the first drive-thru and first In-N-Out in California that opened in 1948. 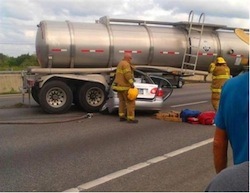 Please visit our Truck Injury Accident Web Site for more information about truck accident injury claims. It is important to maintain focus while driving, which is why you should turn on the air conditioner in your vehicle as soon as you start to get tired. The cold air will cause you to become alert and avoid staying drowsy or sleepy by making your eyes water, which prevents fatigue as well. This is crucial for truck drivers because some companies require them to drive across the state, requiring hours of being on the road. A truck driver that needs to drive through the night till the morning will at some point get tired, making the air conditioner a great tool to help the driver, preventing a careless error that can lead to a devastating and serious truck collision injury for the truck driver and other victims involved. The spinal cord, the main pathway for information to the brain and part of the nervous system, is a common injury that truck accident victims suffer. The spinal cord is injured from damage to the nerves or the cord itself caused by lateral bending, rotation or hyperextension of the cord that can easily occur from a motor vehicle accident. A permanent injury to the spinal cord can lead to paralysis and many spinal cord injuries require therapy and caution when moving around. Please contact us now, including for referrals to doctors who may provide treatment without a request for payment until the claim is resolved, if you or anyone you know sustained a spinal cord injury from any truck accident or other personal injury accident in Baldwin Park, Los Angeles or anywhere in California. For more information about our senior lawyers and law offices, please visit our Attorney Profiles. A historic photo taken of the first In-N-Out and first fast food drive-thru in California, located in Baldwin Park. The Law Offices of Gary K. Walch, A Law Corp., provides you with the strong advocacy that you need when you or a loved one has been through a traumatic truck accident or other personal injury accident in Baldwin Park or anywhere in California, as well as the care and understanding to make this process easier for you and your family. We make it our duty to aggressively pursue your rights and best represent your interests. Our attorneys handle collisions involving truck, car, bus, train, motorcycle, bicycle, uninsured motorist (UM), hit and run, pedestrian and much more. Remember, with our firm on truck & car accident injury cases We offer an absolutely FREE consultation and There is NO fee until you win!